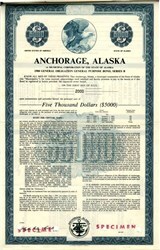 Beautiful engraved specimen General Obligation Bond Certificate from Anchorage, Alaska printed in 1980. This historic document was printed by Jeffries Bank Note Company and has an ornate border around it with a vignette of an eagle. This item has the printed signature of the borough's Clerk and is over 38 years old. This is only the second Muni Bond we have had from Alaska as they quite scarce. 39 coupons attached on top. Excellent condition. Anchorage (officially called the Municipality of Anchorage) is a unified home rule municipality in the U.S. state of Alaska. With an estimated 301,826 residents in 2017, it is Alaska's most populous city and contains more than 40 percent of the state's total population; among the 50 states, only New York has a higher percentage of residents who live in its most populous city. All together, the Anchorage metropolitan area, which combines Anchorage with the neighboring Matanuska-Susitna Borough, had a population of 401,635 in 2016, which accounts for more than half of the state's population. Anchorage is located in the south-central portion of Alaska, at the terminus of the Cook Inlet, on a peninsula formed by the Knik Arm to the north and the Turnagain Arm to the south. The city limits span 1,961.1 square miles (5,079.2 km2) which encompass the urban core, a joint military base, several outlying communities and almost all of Chugach State Park. Due to its location, almost equidistant from New York City, Frankfurt, and Tokyo, Anchorage lies within ​9 1⁄2 hours by air of nearly 90% of the industrialized world. For this reason, the Anchorage International Airport is a common refueling stop for many international flights and is home to a major FedEx hub, which the company calls a "critical part" of its global network of services. Anchorage has won the All-America City Award four times: in 1956, 1965, 1984�85, and 2002, by the National Civic League. It has also been named by Kiplinger as the most tax-friendly city in the United States.